Attorney General Jeff Sessions speaks at a news conference in Baltimore, Dec. 12, 2017. After a Bangladeshi national detonated an improvised explosive device Monday morning near a Port Authority bus terminal in New York, calls for an immigration overhaul grew louder — led by President Donald Trump. "The lottery system and chain migration — we are going to end them fast. 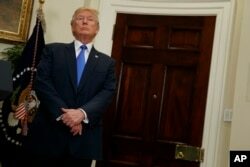 Congress must get involved immediately, and they are involved immediately, and I can tell you we have tremendous support, they will be ended," Trump said Tuesday. Chain migration refers to people sponsoring family members to come to the U.S. 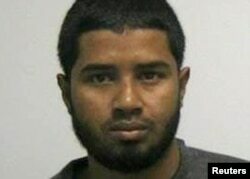 The Department of Homeland Security (DHS) said accused bomber Akayed Ullah, 27, entered the U.S. in 2011 after presenting a passport with an F-43 family immigrant visa — a type of visa that leads to legal permanent residence and is usually given to the children of siblings of U.S. citizens. U.S. Attorney General Jeff Sessions joined the immigration reform chorus at a Baltimore press conference, saying there have been two terrorist attacks in New York in recent months carried out by men who were in the U.S. "as a result of failed immigration policies." "An individual won the lottery in Bangladesh. He came here. He then, through the chain migration process, brought his sister and she brought her son," Sessions said. Advocates say Tuesday's remarks were an attempt to undermine immigrant families and communities. Asian Americans Advancing Justice, a coalition of five civil rights organizations, issued a statement calling it "shameful" to use "moments of tragedy to scapegoat all immigrants and push for unrelated policies that would drastically harm immigrant communities while doing nothing for improving national security." They said the majority of Asian immigrants entered the U.S. through the family-based immigration system. "Many Asian immigrants that come on employment-based [so-called "merit-based"] visas are invested in their jobs and communities because they are able to use the family-based system to reunite with their family members," they wrote. Sessions, who spoke at the news conference with the new DHS secretary Kirstjen Nielsen, called on Congress to strengthen immigration laws. He said the current administration is taking steps to enforce the ones on the books more strictly. FILE - President Donald Trump listens in the Roosevelt Room of the White House in Washington, Aug. 2, 2017, during an event to unveil legislation that would place new limits on legal immigration. "The president is exactly right to call attention to these issues and to how they affect our security. … We should give priority to those who are likely to thrive here — such as those who speak English already or are highly skilled — not someone chosen at random or who happens to be somebody's relative," he said. According to the U.S. State Department, in 2017 about 212,155 immigrants received a visa based on family relationships. The U.S. immigration system is based on sponsorship. A U.S. citizen or legal permanent resident (green card holder) can sponsor relatives from his or her home country to move to the United States. Spouses and minor children qualify as immediate relatives and do not need to wait for a visa number. For those individuals, there's no quota, and the U.S. citizen can simply file a petition. But for brothers, sisters and adult children, the process can be long and difficult. Trump's proposal, merit-based immigration, would reward points based on high-paying job offers, past achievements, English-language ability and education. All of that would be taken into account when green card applications are considered. The higher the score, the more likely an immigrant would be admitted to the United States.